After a long, snowy winter, signs of spring are everywhere. Starting early each morning, birds are singing, woodpeckers are drumming, and in the woods, you may hear a chorus of Spring Peepers or Wood Frogs. 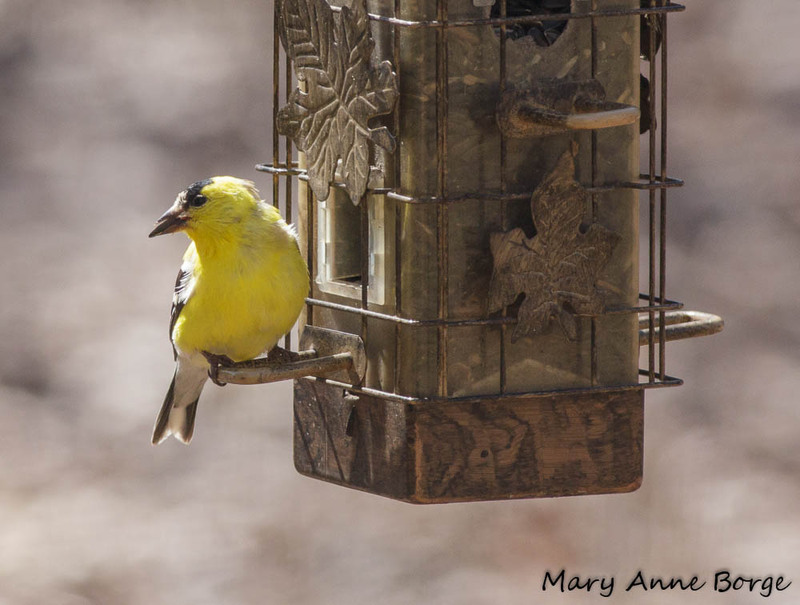 At our backyard feeder the other day I saw a male Goldfinch that had almost completed his change to summer plumage. Chickadees are excavating nesting holes. 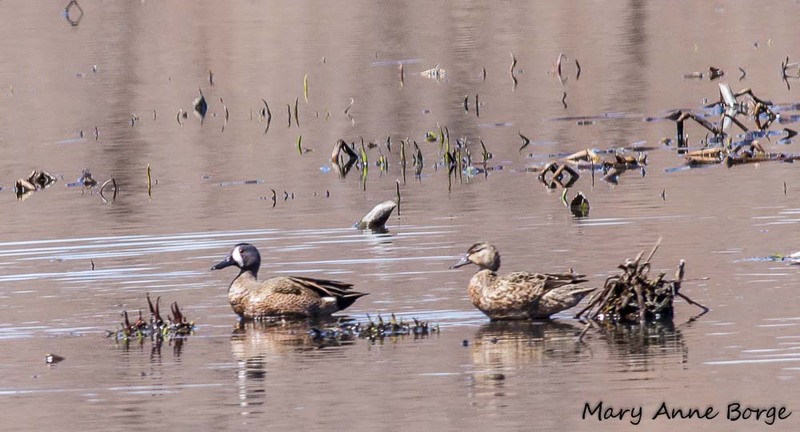 Many birds have paired up for the mating season, both our year-round residents, and winter visitors who are getting ready to head back north to their breeding grounds. 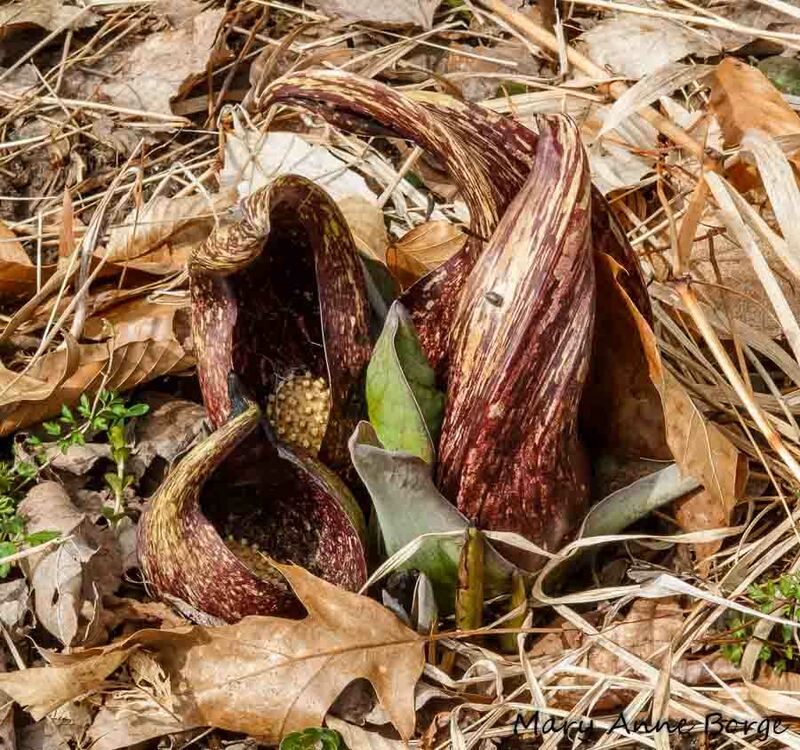 Skunk Cabbage (Symplocarpus foetidus) has been blooming for weeks, American Hazelnut ( Corylus Americana) joined in about March 19, and even Red Maples are in flower. Snow trillium and Hepatica are blooming, too. Change is rapid this time of year. Spring ephemerals that were not even visible one day are a few inches above ground, some with buds, two or three days later. It’s amazing to think that these delicate plants easily work their way through their winter blanket of fallen leaves. This natural covering still provides warmth on cool spring nights, as it helps preserve moisture and prevent competing plants from taking hold in the soil, even after these spring flowers fully emerge. Insects are out and about. I saw my first butterflies of the season this week – 3 anglewing sightings, probably all Eastern Commas, flitting about with only rare breaks. 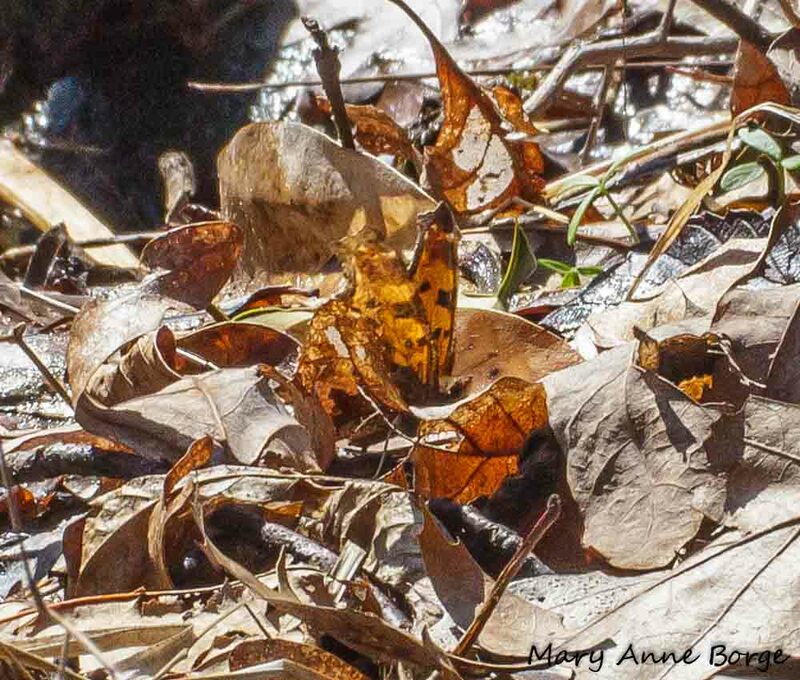 Can you spot the well-camouflaged butterfly in this photo? Mining Bees (Andrena sp.) were very active this week, flying just above the leaf litter, moving steadily back and forth, occasionally taking a break. Mining Bees are solitary. This means that each female excavates her own nest, lays her eggs in brood cells in the nest, and provisions them with food. 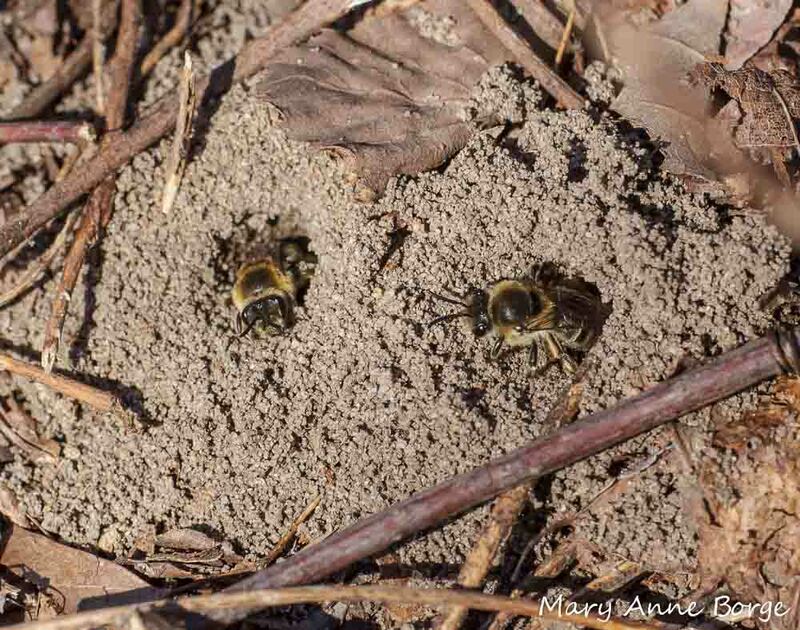 In the case of Mining Bees, nests are excavated in the ground, a practice that gives this family its common name. Above ground, the nest entrances look a lot like the entrance to some ant colonies, but with bigger holes. 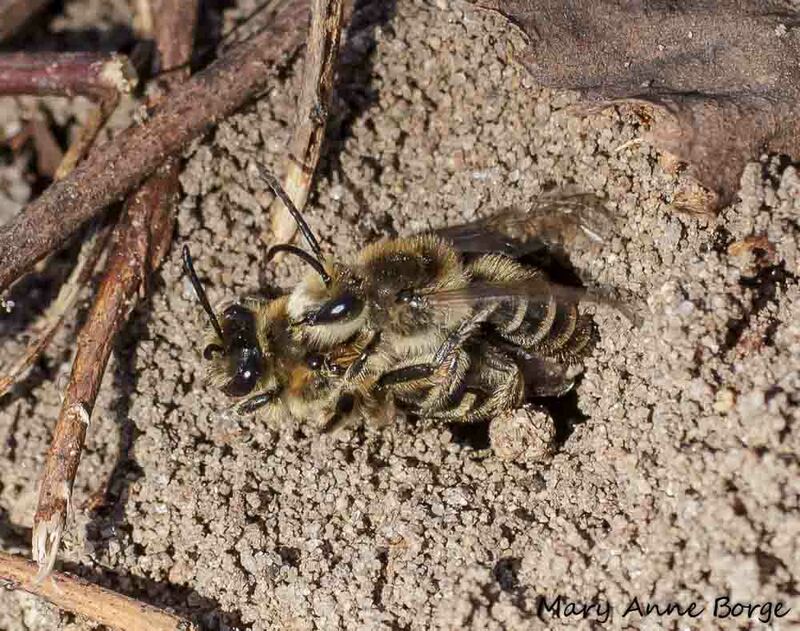 Although each female bee has her own nest, Mining bees often excavate their nests in close proximity to each other, in large aggregations of bees. At Abbott Marshlands, there were dozens of Mining Bee nest holes along and beyond the edges of the trail. Aggregations can be much larger still. The bees in the picture above reminded me of two neighbors sitting on their front porches chatting. While I watched, another bee came in flying low right over them. The bee on the right ducked into her nest, but the bee on the left was receptive to the male bee’s advances. There are about 400 species of Andrena bees in North America alone, hundreds more worldwide. They are abundant in spring, with many species foraging for food on a single plant species, or a few closely related species of plants. One species, Andrena erigeniae, relies almost exclusively on the pollen of Spring Beauty (Claytonia virginica, C. caroliniana) as food for their offspring. Another species, Andrena erythronii, specializes on Trout Lily (Erythronium americanum) as a food source to provision its brood cells for its larvae. Many Mining Bee species look very similar to each other, so sometimes the easiest way to tell them apart is by the plant on which they are foraging. 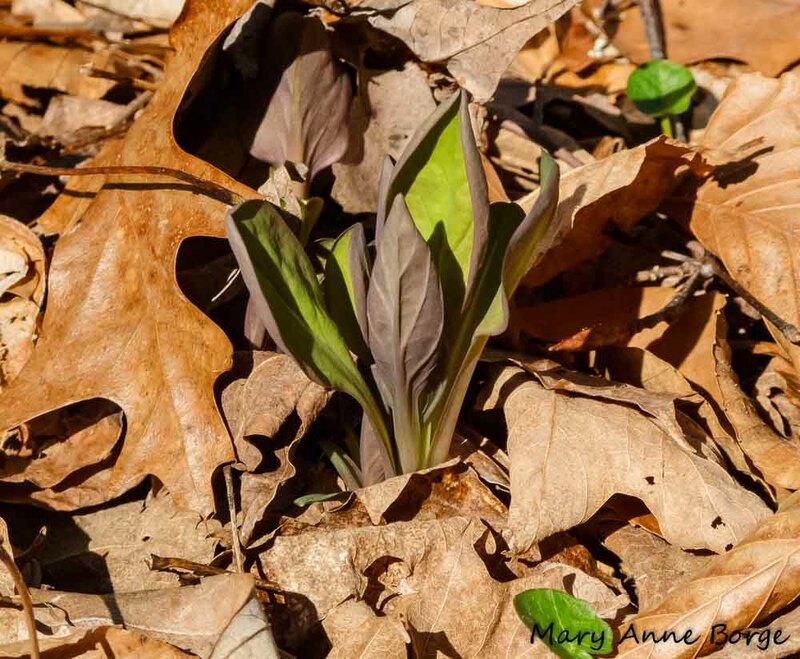 The Mining Bees I saw at Abbott Marshlands were near a location where there is a lot of Spring Beauty, and just a bit farther down the trail, a large colony of Trout Lily. It should be only a few more days before they start to bloom. Which flowers will these bees visit? 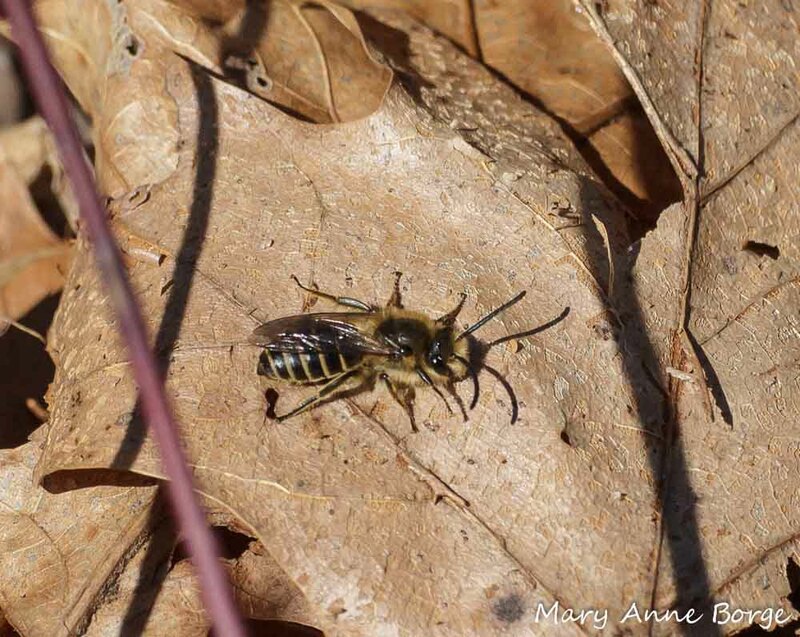 This entry was posted in Birds, Butterflies, Native Plants, Other Insects and Spiders and tagged Abbott Marshlands, Andrena, Bowman’s Hill Wildflower Preserve, Grean-winged Teals, Mining Bees, nature, Skunk Cabbage by Mary Anne Borge. Bookmark the permalink. Are mining bees quite large? I saw a bee the other day that was as big as a bumble bee but had the striped abdomen of the mining bees you have pictured here. There are many species of mining bees (Andrena species), but they all tend to be on the small to medium size. Attracting Native Pollinators by Mader, Shepherd, Vaughan, Black and LeBuhn gives the size range as .3 – .7 inches. They tend to be slimmer than Bumble Bees, and less hairy. The Kaufman Field Guide to Insects is also good if you have access to it. What was the bee doing when you saw it? Thanks, Mary Anne. Great links! I have pretty much ruled out the bumbles because of the stripes on the abdomen. If it isn’t a mining bee I am leaning toward thinking maybe it was a cellophane bee. You may also want to take a look at bees in the genus Anthophora, called digger bees. Some species are a larger and more robust looking, but may have striped abdomens. So many bees! Good luck! Our phenology is way behind! Up here in New York, the skunk cabbages have yet to flower. Oh well, soon, I hope! We’re way behind where we have been for the past few years, if that’s any consolation. We took a hike today that we took exactly a year ago, when we saw Hepatica, Spring Beauty, Rock Cress, Cut-leaved Toothwort, and many other flowers. Today there was nothing in bloom, a few things in bud (Spring Beauty and Hepatica), and some things just peaking out of their leaf blanket. We’ve had such warm winters and springs for the past few years that I’m not sure what’s normal any more! Thanks, Monica. It’s easy to be patient when what you’re watching is so fascinating! Perfectly delightful, Mary Anne. You are so patient, so ingenious, and so knowledgeable in capturing these marvelous photos. A welcomed read. Oh, it’s so good to see this busyness and activity again. It is! I enjoy winter, too, but spring is so full of delight!